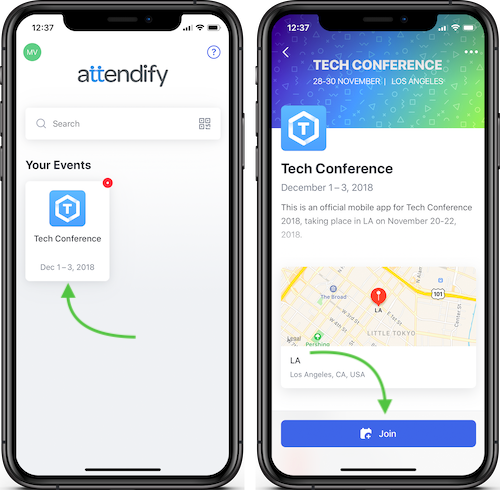 The Attendify app is a container with a lot of different events published by different event organizers. So, the profiles you pre-create for attendees are only applicable to your event. To see this pre-populated information in profile settings users need to join your event first. They will see the suggestions to update their profile with the data you pre-populated for them only after joining your event. 1. Install the Attendify app and tap on Sign Up at the bottom of the main page. 2. Enter the email address that was pre-loaded for the user, their first and last name and set up a password on the sign up screen to create a profile in the app. 3. If the user entered the correct email, your event will appear on their home screen, so there's no need to search for it. 4. Tap the join button to join your event. Enter an event code if this option is enabled by the event organizer and/or verify your email. You can see detailed info about access settings here. 5. 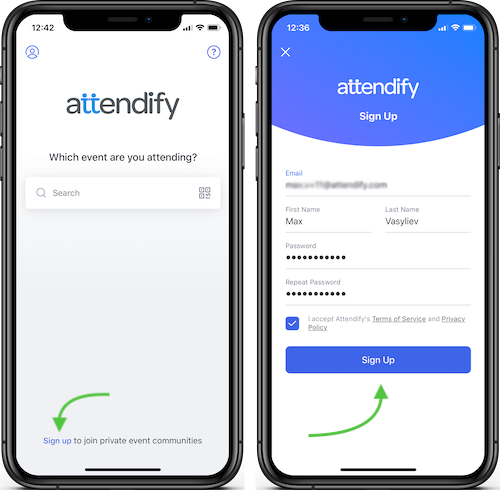 Once you've joined, the app will automatically open profile settings to show the information pre-populated for the attendee. Each user will be able to accept or reject the suggestions to update their profile info. If you have any questions about this please feel free to reach out to us at support@attendify.com or chat with us online.